Last week I was heading in to town (about a 25 minute drive) and I ran out of gas on the side of the highway. Not only was that dangerous but it was also embarrassing! That hasn't happened to me since college! I posted on Facebook about my ordeal and my good buddy Crista said "too bad you don't have the React Mobile app". I hadn't a clue what she was talking about but I was intrigued none the less. Sitting on the side of the road with nothing but time while waiting for the tow truck to bring me gas, I downloaded React Mobile from the App Store. Don't fret, its available for Android too! I don't know what it is but lately I have come across some pretty awesome iPhone apps. I love playing games, listening to music and working from my iPhone. I love everything about my phone. Once I tweeted, "The first thing I see in the morning and the last thing I see before I close my eyes at night...iPhone, I love you" That tweet was retweeted and faved more than any other! So I must not be the only person in love with their iPhone. React Mobile has now given me yet another reason to love my iPhone-personal safety! What is React Mobile you might be wondering? Well, downloading this app turns your iPhone into a life-saving device! Best part about React Mobile, its FREE! React Mobile can allow you to do the following: allow friends and family to follow you if you are alone and fearful with a "Follow-Me" feature, send an SOS alert to authorities, friends and family and a big bonus is that it can be used internationally! The video below is pretty fantastic and it helps to highlight what the app is capable of. React Mobile is your own personal silent alarm. I know that I feel safer knowing that help is only a button-push away. 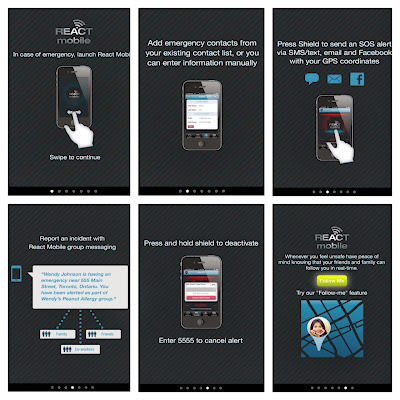 How would React Mobile make you feel safer? Where would you use it? Interesting app. Seems like this could be useful! Sounds like a really helpful app! I am sharing with my hubby now to download to his smart phone! Thanks for sharing! This seems like a really great app. Going to download it right now. WHOA, really, I've never heard of this but really like the idea especially since I spend a lot of time out and about alone. I'll check into the Android version, thanks for sharing! I need this app! I travel so much and always wonder what the heck I would do if I broke down in the middle of nowhere. Thanks for sharing.